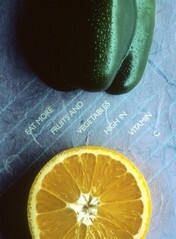 From an overhead angle, white diagonal lettering on a purple background reads: "Eat More Fruits And Vegetables High In Vitamin C." above the lettering is a green pepper, below, one half of an orange, inside up. Shot on 4x5 format. This was used in the 1989 calendar "Eat for Good Health" March 1989.